"Here to save your lifestyle.™"
If you are suffering from acute or chronic neck, back, arm, or leg pain, scoliosis or other spine deformity, or a herniated disc, allow Desert Institute for Spine help you feel good again. Our goal is to reduce your pain and return you to your normal activities as soon as possible. We provide services for all who live locally in the Phoenix metropolitan area, nationally, and internationally. Most of our patients respond to one of our many non-operative programs to alleviate back pain and can avoid spine surgery. We specialize in conservative spine treatment for neck and low back pain, including trunk stabilization physical therapy, various types of medications, activity modification, and therapeutic injections. There are a number of surgery options available to the patient who has not responded to the available conservative treatment programs, and often benefit positively from skillfully applied spine surgery intervention. Allow Desert Institute for Spine care for you, and help you regain your lifestyle. As a proven leader in the surgical treatment of various spine conditions, he has performed over 5000 surgical procedures ranging from complex deformity surgery such as scoliosis, degenerative issues, trauma, and simple decompression issues related to spinal stenosis and herniated discs. Dr. Duane Pitt is a fellowship trained Orthopedic Spine Surgeon that has continued to provided excellent care for the patients of Arizona for over 15 years. We specializes in all orthopedic spine disorders of the cervical, thoracic, lumbar, and sacral spine in both adolescent and adults with a focus on both non-operative and operative treatments for back pain and scoliosis. His one-on-one care for the patient with the use of his physician assistants will leave you comfortable with his patient care. In an effort to provide the best care for you in a timely manner, you may see on occasion our Physician Assistant who is an extension of Dr. Pitt. You will see Dr. Pitt on your first visit and he will develop your plan of care, unless you have an issue you feel must be evaluated earlier than his next available scheduled appointment time, in which case you can see the Physician Assistant who will initiate treatment for your pain, order the necessary diagnostic studies or labs, and provide a initial treatment plan prior to your visit with Dr. Pitt. This will greatly accelerate your treatment and will provide Dr. Pitt all of the necessary diagnostic information to activate a definitive treatment algorithm specific to your needs. Dr. Pitt is trained in Minimally Invasive Spinal Surgery for all types of spine disorders and utilizes traditional and state of the art surgical techniques such as artificial disc replacement, microdiscectomy, minimally invasive spinal fusions, as well as many others. He is a spine surgery consultant for a number of professional athletic teams locally and nationally including the Arizona State University Athletic Department, San Francisco Giants, Oakland A's as well as many others, and provides the same level of care to all of his patients suffering from back pain or other conditions of the spine. Dr. Pitt is grateful to his creator for his many accomplishments. 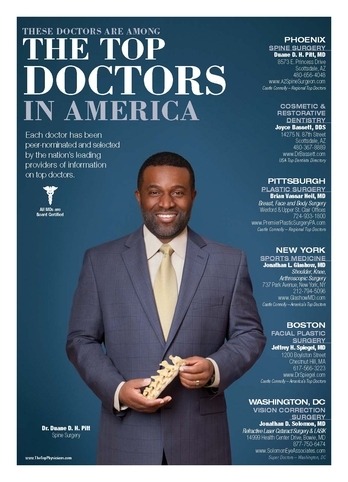 He has been listed in Phoenix Magazine (Top Doctor) as Arizona’s Top Spine Surgeon, and Nationally recognized as a top doctor in the United States by Castle Connolly. Received the most votes from other physicians!